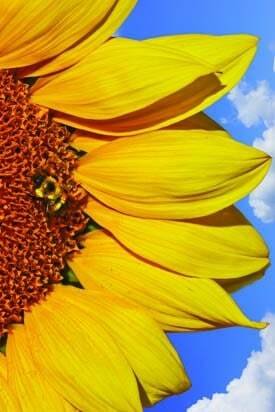 Many bees need protection from pesticides and other threats. Honeybees flitting from flower to flower is one of the first signs that warm weather has arrived. Honeybees are a welcome presence in the garden, pollinating plants and contributing to local honey supplies. Despite their importance in the ecosystem, honeybees are in grave danger. In 2014, President Barack Obama created a task force comprised of various agencies to address the growing issue of rapidly diminishing honeybees and other pollinating insects. This initiative was a response to reports from American beekeepers indicating hive deaths have been on the rise, gravely affecting the honeybee population. Honeybees pollinate many fruit trees, nut plants and vegetables, playing a crucial role for many nations’ food industries. In addition to government involvement and honeybee conservation methods designed by environmental agencies, there are many things that regular citizens and homeowners can do to protect honeybees this summer. The Environmental Protection Agency and the Pesticide Action Network offer these tips. Use caution when applying any pesticides to home gardens. Be especially cautious when applying pesticides when bees are likely to be flying. If you must apply pesticides, do so only after dusk. Stagger your planting throughout the growing season. Rather than planting everything at once, stagger planting for flowers and other plants that have blooms. This gives bees plenty of pollen sources throughout early summer and into fall. Provide clean sources of water. A small garden feature or a rainwater collection is enough to provide bees with a drink when needed. Honeybees and other bees require some sort of shelter. Dead trees and plants provide adequate shelter, so don’t be so tempted to pull out all of the undergrowth in the name of aesthetics. Plant a garden that will attract bees. Resources for planting a bee-friendly garden can be found by visiting panna.org/sites/default/files/Bee-FriendlyGardening_PAN.pdf. If you come across a hive, leave it alone. It’s best not to disturb a hive and honeybee colony. If bees are located where they can become a nuisance, contact a local bee expert to see if the hive can be moved. Think about becoming a beekeeper yourself. There are many different resources available to help you get started. Bees are being threatened at an alarming rate. Educating yourself about what to do to protect honeybees can help to restore the valuable honeybee population.